I know, I know… we have QRZ and eQSL and LOTW (Logbook of the World) and Ham Radio Deluxe (HRD) and Netlogger and N1MM and… blah, blah, blah. An old fashioned paper QSL card is still sweet to hold in your hand and to enjoy the real memory of a fun contact. Especially if it’s a DX station from a far away land toward DXCC or the last state you needed for WAS. Tom (KD8DQK) and Bill (WR8S) work on configuring Ham Radio Deluxe DM780 for our ARRL Field Day stations high atop the mountain. Well… the 2015 ARRL Field Day adventure is in the books… the logbooks, that is. Having experienced decades of Field Day excursions, this one takes the cake! What started out as a hot, sunny, humid Friday afternoon setting up our station high atop Chestnut Ridge, ended on Sunday afternoon having operated under conditions of torrential rains, a downward shift of 40 degrees in temperature, one antenna failure, one operator unable to man a station due to illness, a generator choked-out by all the moisture in the air and eventually walking around in a literal cloud! We had three layers of clothes on and could see our breath on Sunday morning! To say the least, it was a unique set of challenges to overcome. Plan A was to slingshot and hang 3 doublet antennas, run 2 KX3’s for CW and PSK31, and run an Icom 7200 with a new Heil Pro 7 headset on voice. We had a 5500 watt generator and 25 gallons of fuel to keep us purring along. With 4 operators we had a good chance to keep all rigs racking up points for the duration. Laptops were ready to log and the plan sounded solid. The goal was to beat our score from Field Day 2014 and thought a good mix of voice and data would do the trick. Our usual set-up has us mooching off of WR8S’s generosity when he goes to the trouble of of hauling his camper to the top of the mountain. We extend the awning and set up a table or two to operate from. 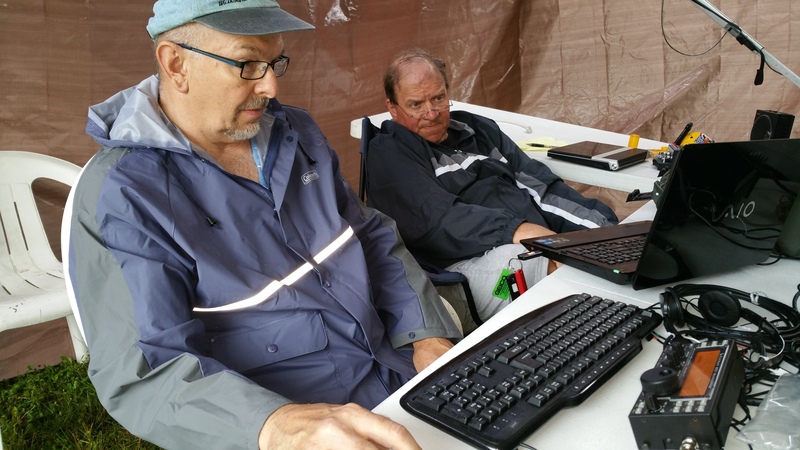 Field Day 2014 was done via battery power and QRP mode. WR8S and KD8DQK bundled up… oh wait…WR8S only brought shorts! Wins endurance award! Sunday morning in a cloud! WT8WV with 3 layers of clothes and hands so cold it was difficult to run DigiPan for PSK31 contacts. The video below is a typical contest exchange using CW (Morse Code) and in the ARRL Field Day Contest an exchange of information would be the call sign of the other station, your operating mode (how many radios are you running and what sort of power and station are you running), followed by your section of the country. Then you return your own exchange to the other station and move on the to next contact by calling “CQ FD CQ FD de WT8WV WT8WV” and hope for a return of your call sign for a confirmed contact to log. CQ means “calling anyone”… FD means your are calling for the “Field Day” contest… de is French and means “from”… and WT8WV is our station’s “identifying call sign”. (You will see Bill (WR8S) make a contact and then write down the exchange from the other station on the log paper… then he begins calling CQ FD CQ FD de WT8WV using a memory keyer that he can program with the CQ message, our contact information and a thank you good bye message. He just needs to use the keyer paddles to send the other stations call sign during a contest.) Our return message to the other station to enter into their own log was, “WT8WV 2A WV”. The pictures below tell the story of our challenges and our solutions. I have to admit I thought we were DOA when the generator croaked at 4:30 am on Sunaday… but we quickly came up with Plan X and realized WR8S had a converter in his truck! Back to battery power to finish of a good run of PSK31 and CW for 2 points each! The original team plan was to use my new call sign WT8WV and be “3 Alpha West Virginia” but Jay got sick on Friday so we were now down 1 team member and 1 radio. Then we had a balun issue with 1 doublet antenna. So now we are WT8WV 2A WV with 2 Elecraft K3’s and 1 antenna. We decided to salvage our potential scores by focusing on PSK31 and WR8S’s speedy left hand on CW… and forgo voice comms. Bill’s new eBay score! SWEEEEEET! Tom working on busted antenna while Bill tries to thaw out from a cold night. Bill loading software and setting features. Added a 24 X 12 tarp for 3 total sides to block prevailing weather and winds. Generator exiled away for less QRN. Tom runs PSK31 as Bill logs. Spence working PSK31 and Bill keeps him straight. Bill cranking out CW contacts as Spence logs. Used a nice Android App to log with a bluetooth keyboard. Tom and Bill hook-up inverter to salvage our weekend. Tom saves the day! Good Boy Scout… WAS prepared. Tom fixed us a wonderfully WARM Sunday breakfast and we continued to grab a last string of PSK31 on 20 meters. A nice last hour run of CW on Sunday morning by Bill. Bill brought a 16 foot long string of BRIGHT LED’s to light up our lives! Best gizmo of the weekend! I love Ham Radio Deluxe software! It has it ALL for your hamshack! This is serious software for the serious Ham Radio Operator. It integrates with soooooo many other Ham softwares, rigs and rotors. The heart of Ham Radio Deluxe, Rig Control provides a customizable interface to control your amateur transceiver using its built-in computer aided control interface. Rig Control allows you to organize buttons, sliders, and drop-downs to toggle radio options, select modes and filter settings, and control various level inputs via your computer screen. HRD Rig Control brings out features buried in a modern rig’s menus, making it easy for you to optimize your rig with a few clicks of the mouse. Logbook also interfaces with DX Spider cluster servers for spotting the rare ones. The Bandmap feature graphically displays spots within a band with up to 10 bands visible at once. With just a click of a mouse, swing your beam to the DX station’s heading. Once you have the rare DX in the log, integration with Trusted QSL makes uploading to Logbook of the World a snap! Downloading from LoTW is just as simple. In fact, Logbook interfaces with many popular electronic logbook services, including eQSL, HRDLog.net, and ClubLog. Logbook keeps track of many popular awards too. Logbook is packed with features! Digital Master, formerly “DM-780,” is the all-purpose digital communications package integrated with the Ham Radio Deluxe suite. Digital Master uses your computer’s soundcard interface and radio connection to offer a wide range of communications options to the amateur radio operator. Digital Master is capable of a wide range of digital modes, including CW, RTTY, SSTV, PSK31, MT-63, and more. For the CW enthusiast, Digital Master interfaces with the popular K1EL WinKeyer. True frequency shift keying (FSK) and audio frequency shift keying (AFSK) keying are available for RTTY operation. You can stay on top of the action with Digital Master’s SuperSweeper, allowing you to copy up to 40 QSO’s at once in CW, RTTY or PSK. Once the QSO is complete, Digital Master interfaces directly with Logbook to record the contact. Digital Master works with a variety of audio and multimode interfaces including the Timewave Navigator, SignaLink USB, and West Mountain Radio RigBlaster. Ham Radio Deluxe’s Satellite Tracking module takes the guesswork out of satellite operations. Using the latest orbital mechanics equations and up-to-the-minute Keplerian element information downloaded from a variety of trusted sources, you can predict satellite passes with confidence. Customizable visualization keep you apprised of the satellite’s foot print, projected path, and predicted elevation for given passes. A real-time link to Google Earth allows one to see what the satellite “sees” as it flies overhead – great for presentations! Real-time tracking feeds azimuth and elevation information directly to rotator control for automated positioning of satellite antenna systems. Satellite Tracking automatically calculates Doppler shift for the satellite’s transponders and sends tuning data to Rig Control, keeping your radio locked in the transponder’s passband. Integrating with Logbook and Satellite Tracking, Rotator Control manages beam headings via any computer interfaced rotator controller. Many modern control boxes such as the M2 RC2800PX, Green Heron RT-2x series, Yaesu GS-232, MDS RC-1, and HyGain DCU series controllers have computer control capability. Many more can be retrofit for computer control – why not put them to work? Rotator Control displays a Mercator or great circle projection map that enables click-to-point rotator operation. Drop-down country lists also make it easy to find those rare DX entities: simply select the country name to point your beam and start calling. Rotator Control is the finishing touch for your station integration project. HRD Software offers multiple forms of support. You can talk to a live person by calling or emailing the support department. An email opens an automatic trouble ticket which is responded to by a member of the support team. You can check also check on your Ticket Status via the Internet. Our support team may recommend a remote session using Teamviewer to ascertain where an issue may be and to fix it. There is also the option of using the Forums for peer to peer support. HRD Software has a YouTube Channel that features several videos that can be used to help configure your system. Logbook of The World (LOTW)… not as difficult as you think! I set up LOTW and it was not as hard to do as I was led to believe! I have the TQSL’s for all 3 of my ham radio licenses dating back to the 1980’s… KA8LJO… KB8FIR… and now WT8WV… here are some helpful videos to assist you in getting it up and running fast and easy. (I learned a lot by watching the videos before I even downloaded it!) I will add links to LOTW at the end of this post so you can get everything you need.